Despite the fact that many people refer to several species of cockroaches as water bugs, in actuality, the water bug is an aquatic insect classified under the Hemiptera order. The insects of the Corixidae and Nepidae families are true water bugs. hese true water bugs are insects that use their legs as paddles to move through the water. The members of the Gerridae family are also water bugs, but instead of using their legs as paddles, they take advantage of the surface tension to stay afloat. The members of the Halobates family are the only water bugs that are entirely aquatic. 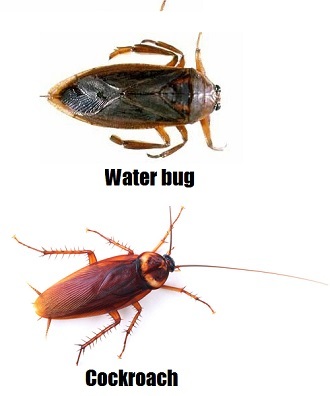 When comparing a water bug vs cockroach, the cockroach is the older and more adaptable kind in the kingdom of insects. Despite the fact that they reproduce and locate in warm, moist areas, they are aquatic. The cockroach is an insect that digs and consumes any source of food available. This insect is nocturnal and hides in the crevices during the day. They are capable of spreading diseases to humans and can cause allergies and asthma and can be a real nuisance like other pests such as bed bugs. They are attracted by food sources in homes and other warm, cozy places. Insecticides, powders and cockroach traps are temporary solutions for an infestation. Contact a professional pest control to search for options of extermination. There is no difference between a cockroach and an insect palmetto. In the United States, particularly in the southern region, the American cockroach is known as palmetto bug (insect palmetto) or water bug (insect). Originating from the African tropics, it is believed that the American cockroaches were brought to North America on a slave ship. At present, these can be found around the globe. There are also other species such as the German cockroach and the oriental cockroach. 5 What do cockroaches look like? 7 Where do cockroaches and water bugs hide? The American cockroach is reddish-brown in colour and considered a large insect as it sometimes exceeds 1.5 inches in length. Some cockroaches of this species like other have wings, yet most are unable to fly. Adults bright yellow margins in the back of the head, while others will just look like black bugs and it can be tricky trying to tell the difference. The male and the female of this species are very similar in appearance and size. The two have a couple of cerci at the tip of the abdomen, but only the male has a set of styli. Some people can mistake a small roach for a bed bug as they are also dark brown with flat bodies. Waterbugs and cockroaches usually feed on organic matter, however while looking for a food source, they can eat almost anything, even paper. They are commonly found in dark and moist areas such as basements, drains, sewers and tubs. Outside, they are mostly found in the courtyards, wood piles, tree holes or in the mulch. If you find an infestation of these insects, contact the professional pest control to help you exterminate them. These insects are widely known, both by the high number of species and by the fact that they interact continuously with humans causing benefits or damages. The aquatic insects develop their entire life or part of it in the water. The larval or juvenile stage is generally developed in water, and the stage of the adult in the terrestrial environment. Aquatic insects are those groups of insects that have some stage, larvae or adult, associated with the water (e.g., lakes, rivers). A small fraction of all insects, between 3-5% of the species are aquatic. Water bugs prefer to live in water, but the low number is probably due to the limited amount of fresh water available in relation to the surface of the earth. However, they are taxonomically diverse and interesting in structure and biology. Some are important for public health, such as those that help keep mosquito populations under control. They are an important component of the aquatic ecosystems. They are food for fish, birds and amphibians. These insects are detritivores, herbivores, predators and parasitoids. Generally, cockroaches make up a large group of insects whose evolution can be traced back to more than 300 million years ago. There are about 4,600 species and more than 460 genera, but only a few 30 live in habitats of humans and some 4 are considered pests: the American cockroach, the Australian cockroach the German cockroach and the oriental cockroach. It is estimated that only 1 percent of all species is harmful to man. Cockroach identification and an ability to tell the difference between different common species is an important step to proper pest management. Roaches typically have a wide, flattened, oval body with a large flat plate attached to the chest (3 segments) which covers part of the head, which is small and has thin and flexible antennas attached to it. The abdomen is divided into 10 segments. The entire body is protected by a hard exoskeleton covered with a waxy substance. They have large compound eyes and mouthparts that are adapted for biting, chewing, and sucking liquid food. They also have several receptors and are tactile. Their wings are attached to the segments of the chest; the first pair, the tegmina, are hard and serve to protect the second pair of membranous wings used for flying like other types of flying insects. They have 3 pairs of legs attached to the thoracic segments and the claws. The hind legs are longer than the front. All have along some small structures similar to thorns which may have sensory functions and help with movement in difficult terrain. Their size is variable; the longest giant water bug, Megaloblatta longipennis reaches 97 millimeters in length and 20 centimeters in size. The heaviest, Macropanesthia rhinoceros is a little more than 30 grams. They have a multitude of colors, from light brown to black, and patterns of spots, stripes and circles that make up designs that you might not have thought a cockroach to have. The most effective natural method for cockroach control is prevention. Health conditions play an important role in the prevention of cockroach and water bug infestations. Where do cockroaches and water bugs hide? When comparing a water bug vs cockroach, some cockroaches enter houses in infested bags and boxes of food. Inspect all groceries before saving them and keep the bags outside, in storage areas. The used boxes must be disposed immediately. Another simple measure to prevent infestation is to keep doors and windows closed and make use of protective screens. The ventilation ducts of the attic must be examined, and the cracks and fissures in your house must be temporarily filled with pieces of wood shavings. Cockroaches are often found near drains. By eliminating the sources of water can prevent infestation: repair any leaks in the bathrooms and the kitchen and avoid leaving pots of water outside for long periods of time. Get rid of standing water around the house. The mulch should be used several inches away from the foundation of the house. The wood for the fireplace should not be stacked near the house; it must be inspected carefully before bringing it in and using it. Trash should be disposed off on a regular basis. Dirty dishes should never be left in the kitchen during the night. Keep cooking appliances clean and free of food debris. Pet food must be properly covered. Despite the fact that these measures can prevent the spreading of an infestation, professionals in the pest control should be consulted to treat existing infestations before they get out of hand. Getting rid of roaches is not simple. They have a great capacity for adaptation and survival. In addition, when they invade a home, they never do it alone, but in colonies of hundreds. This is why killing roaches should be a properly planned process, minimizing the risks and discomforts and increasing the effectiveness of the measures applied. How do I remove or kill the cockroaches? Today there are numerous methods to put an end to them from the traps, roach baits or sprays to professional services of fumigation which can be carried out by commercial pest control companies. How to get rid of cockroaches naturally?. Cockroaches do not like the scent of herbs. Put some crushed bay leaves or a little bit of mint in areas where there are cockroaches. With the following trick (the most effective found to date), not only will you be able to eliminate cockroaches that you see, but it has an impressive residual effect that we will discuss at the end. · Sugar confectionery or spray. · A few tablespoons of milk. Put 1 tablespoon of boric acid and a spoonful of sugar in a bowl and stir. Then, add milk little by little and keep stirring to make a semi-solid paste that can be formed into small balls. Make several balls the size of a pea and put them at places where you think they have made their homes. Looking for areas around your home that have food or standing water exposed. · Keep pet food well covered or box it when not in use.. The water bugs or cockroaches and other insects can feed on the pet feed to survive. If possible, determine feeding hours for your pet so your dog or cat can eat their food and you can wash the bowl immediately. This will certainly help with effective water bugs and roach treatment. · Place food inside the refrigerator when possible. If you cannot refrigerate, put it in airtight containers. · Use garbage cans with tight lids. The garbage cans and compost piles that are open to the air will attract, feed and incubate more insects. Take out the trash daily in case you are suffering from a cockroach infestation. · Keep the outside of your house and your backyard tidy. The water bugs live in places that are rarely cleaned. · Recycle newspapers and containers of food each week. Make sure that your recycling containers have tight lids on them. · Remove old boxes of cardboard. These are popular hiding places for insects. · Look for standing water inside and outside the house. The pet water containers, tarpaulins, water glasses, dishes, pots, bird baths and rain water can act as cozy places to incubate water bugs. Such places help them multiply very quickly. · Cover all containers of water properly. If you cannot cover water in places like bird baths, keep changing the water regularly to keep it clean.· Thoroughly clean the kitchen with a disinfectant. Be sure to also clean appliances such as the toaster, food processor, blender, grill and other places where food particles are likely to get trapped. · Limit the intake of food to one room in the house. Discourage children to eat in their rooms or in front of the television. This will help clean the rest of the house clean. It is best to decide one eating spot in the house for the whole family like the kitchen or the dining room. · Clean the dining room on a regular basis. These kinds of control methods will prevent further insect infestation. · Clean the rugs or carpets with soap and water at least once a year. · Repair leaky faucets inside and outside the house. Be sure to place these items on your list of things to do immediately. Cockroaches can remain alive for a long time if you have a constant source of water. · Examine your home for signs of ill-fitting doors or windows. Replace them if possible or line them for airtight fit, so that insects cannot enter. You may need to enetr a crawl space to check out areas of your house. · Fill in the gaps in particular to reduce the accumulation of water. · Seal the holes in the insulator or on the walls. This will eliminate all forms of insects that are bound to create a nest. · Identify spots where nests are located. This will help you to get rid of the problem of water bugs quickly. · Pour in 2 to 4 cups (0.4 to 0.9l) of distilled white vinegar in all your drainage pipes. This includes your sinks, bath tubs, shower areas and toilet. · Pour some liquid dish detergent in your pool, if you notice an infestation. Shut off the pump. When the insects die, they float to the surface of the water. After a few hours you can use a pool skimmer to clean the water. Then drain out that water and fill your pool with fresh water. · Create a mixture with one half of powdered sugar and one half of sodium bicarbonate. Sprinkle the mixed fine dust in the area of the insect infestation.. Wait for the insects to die and then clean the area thoroughly. · Sprinkle infested areas with borax. The boric acid will kill the insects after which you can clean off the place. · The water bugs are able to avoid large accumulations of Borax, so make sure that it is a very fine powder that is sprinkled in and around their nests. · Use roach traps for effective treatment. These traps use a poison concentrated within a box. The insects are attracted and die within the box for safe disposal. · Call an exterminator or wildlife management consultant. If your house is infested with insects in water, you may need to use a more aggressive chemical treatment and control methods. In this case, you will have to evacuate your home and clean up the kitchen and other surfaces before use!